Please inquire regarding rates because they are subject to change. Also, I have a second property listing #889992. Please take a look at that listing as well. I named this house "Seven Saturdays" because when you are on vacation everyday seems like Saturday!! GREAT HOUSE--2 Minute walk to the ocean with no streets to cross. 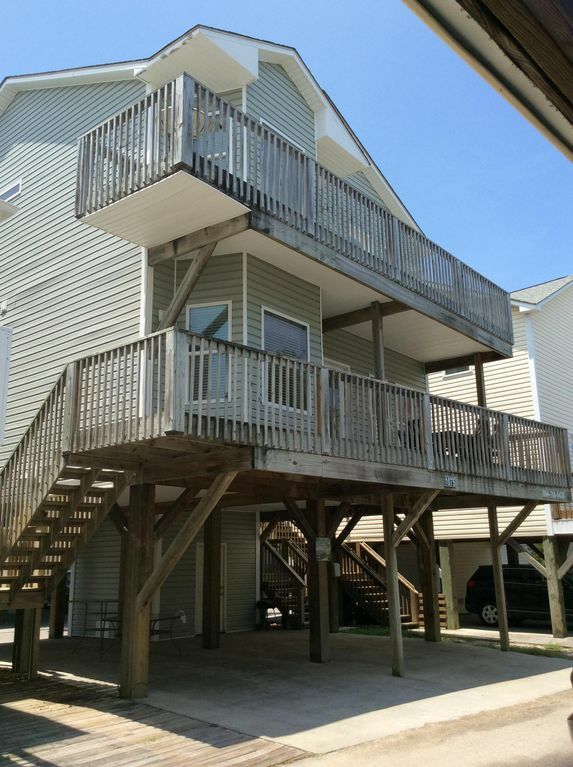 The house has 2 decks on front and 2 decks on back with ocean view from all 4 decks. There is a view of Sand Dollar Lake from the front 2 decks of the house. Fishing is permitted in all of the fresh water lakes inside Ocean Lakes. With Sand Dollar Lake being only a few steps away, you can enjoy fishing for catfish, bass, bream and carp. There is outdoor seating as well as tables for meals. There is a gas grill at the house for outdoor grilling. The house has 2 sets of stairs resulting in 2 ways in and 2 ways out of the house in case of an emergency. This is a raised beach house with parking under the house for 3 vehicles with additional parking in the Ocean Lakes overflow area. There is an outdoor private shower with hot and cold water and an area for drying. This could be used for an extra shower area if needed. This is a custom built, one owner house with five Bedrooms and 3 full bathrooms. There is one queen size bedroom on the lower level and one full bathroom on the lower level. There are 4 bedrooms and 2 full bathrooms on the second level. The layout of these 4 bedrooms is as follows: 1 kingsize bedroom, one queen size bedroom, 1 bedroom with 2 twin beds and 1 bedroom with 2 sets of bunk beds (one has a full size futon on the bottom bunk). All bedrooms have a TV with expanded cable. 11 people can sleep upstairs. The house has a very large kitchen. There is seating at the table for 8 people and seating at the bar for 4 people. The kitchen is well stocked with everything that you should need. There are all the small appliances (electric can opener, blender, toaster), a Keurig coffee pot as well as a regular 12 cup coffee pot. There is plenty of dishes, pots and pans, silverware, and glassware in the house. The house has an Osmosis water filtration system that feeds both the sink area and the ice and water features of the refrigerator eliminating the need to purchase bottled water. There is also a dishwasher, garbage disposal, microwave and washer/dryer. The living area has ample seating, a 55" smart TV with expanded cable available, and WI-FI. This house is a 2 minute walk down to the ocean. Ocean Lakes is a GREAT resort and I encourage you to go to view all the amenities the resort offers. I especially enjoy the comfort of it being a gated community with security 24/7. Thank you for inquiring about my property. I look forward to the opportunity to earn your vacation rental business. My husband and I both grew up in the upstate of SC and have not ventured far from it. We feel very blessed to be in such a wonderful area. I graduated from Dorman High School and he graduated from Chapman High School. We have owned our automotive repair business in Spartanburg, SC for 38 years. Our mission for that business, as well as our mission for our beach rental business is very much one and the same; to make sure our customers/guests have the very best experience that we can possibly offer them. We have two grown daughters that we are extremely proud of and two precious grandsons that are the light of our life. My husband and I are so blessed to have our mothers still with us. Between the two of us we have a large family and that makes for such a grand time when we are all able to be together. Family is what is it all about! Myrtle Beach has been a part of our lives forever it seems. We have seen so many changes and positive growth in this area of the state. We started staying in Ocean Lakes when our girls were small. Back then we camped in a tent! That was truly an experience. Then we purchased a pop up camper and our girl's idea of a good vacation was taking the dog and the camper to Ocean Lakes for the week. I have to admit, it was a grand time. We debated several years before actually deciding to build our first property in Ocean Lakes. It was an adventure. Then shortly after that we had an opportunity for another property presented itself. We also love the fact that Ocean Lakes is a gated community with security 24/7. In addition, it is a family owned resort and I like the fact that it is not part of some larger chain of resorts. We chose Ocean Lakes because the Jackson family has provided an affordable place where you can escape your day-to-day lifestyle and just enjoy some fun in the sun! We wanted to be part of this and have something that we could share with our family and friends. We hope that one day, this area will become our permanent home! Ocean Lakes is a unique place because everything you need is "under one roof" so to speak. There are so many activities and events to become involved with and you never have to move your car. This is just a GREAT place for families. I enjoy being part of a gated community where security is 24/7. This is very comforting. This house is only a 2 minute walk to the ocean with no major streets to cross. This is a GREAT resort for families and individuals. Everything to do inside. There is a view of Sand Dollar Lake from both of the front decks on the house. This house has 4 decks. 2 on the front and 2 on the back. There is an ocean view from all 4 decks. Parking Under House For 3 Vehicles. Additional Parking Available In Ocean Lakes Overflow Area. Living Room Has Ample Seating. There Is A 55" Smart TV With Expanded Cable. The Living Room Area Is Open And Airy. Kitchen is very large. Complete with all small appliances and plenty of dishes, pots and pans, silverware, glasses, etc. Dishwasher, Garbage Disposal, Osmosis Water Filtration System, Washer/Dryer. 55" Smart TV In Living Room. All Bedrooms Have Wall Mounted TV's With Expanded Cable. Books are not provided in the house but the Ocean Lakes Recreation Center has a small library where you can check out books. Prestwick Is Located 1 Mile From Ocean Lakes And Ocean Lakes Guests Are Offered A 40%-60% Off Regular Price. Reservations Made Through The Recreation Office. 100+ Other Courses Available. This property is not handicapped accessible in any way. SO MANY ACTIVITIES INSIDE OCEAN LAKES RESORT. THEY WILL ALSO MAKE RESERVATIONS FOR YOU AT THE LOCAL ATTRACTIONS. THERE IS CHURCH EVERY SUNDAY MORNING ON THE PREMISIS. THERE IS A NATURE CENTER ON THE PREMISIS. MANY INTERACTIVE ACTIVITIES TAKE PLACE IN THE RECREATION CENTER EACH DAY. THERE IS A SKATEBOARD PARK CALLED SANDY'S DOWNUNDER LOCATED UNDERNEATH THE HUGH DECKING ON THE BEACH. House was great. Close to the beach and very comfortable. Great Place to Stay with the Family ! We truly enjoyed our stay, the home was spacious and very clean, easily and comfortably accommodated My large Group of 11. Owner made sure we had what we needed, even calling to welcome us & give insight on things to do and places to see around town. The on site waterpark was plenty of fun for thee entire family. We’re planning to stay again this year. We had a great time family and friends gathered for my wedding. We loved the kitchen and the decks at every room. Kids loved it was walking distance to the beach we would stay there again and highly recommend. My family of four stayed the entire week.. we had the grandparents a few nights, and then invited another couple and child to stay a couple nights.. we had an amazing stay and although no spaces are huge there is plenty of privacy for everyone.. its the perfect place to access everything Ocean Lakes had to offer..we had several breakfasts at the Meet & Eat, went to Family Ceramics daily (we love the souvenirs we make), took full advantage of the Sandy Mart and game nights.. you really don't have to leave the campsite unless you want to.. Dinner and band at Wahoo's at Murrells Inlet was worth the trip.. We fished the ponds, cooked at home daily at least one meal, and enjoyed the decks morning, noon, and nightly.. the golf carts are the way to travel and the "parade's" fun if you have patience.. we enjoyed it nightly..also, we had dinner two nights at a neighboring resort which offers karaoke and a nice outside beachside easy dinner..kid friendly. We would recommend to all and will most def go back!! Thank you for the wonderful review. The recommendation to others is greatly appreciated and I look forward to serving you and your family in the future. Thank you for the great pictures you sent of your family having fun!!!! This place was perfect for my family! Very close to the beach and pool! Shopping and restaurants close by! Would highly recommend to anyone! We will be back! Thank you so much for the review Melissa. I'm so glad that you all enjoyed your stay. It means a lot for me to have something that others can enjoy for a time. We had a awesome spring break. Your place was very nice, and just a few steps to the beach. Everyone enjoyed there stay and are already planning their next spring break with you . Thank you so much for this GREAT review. My goal is to make your stay a vacation to remember because the memories you make is what really counts!! I look forward to serving you next year. Inside the resort there are outdoor pool, indoor pool year round, Splash Zone Waterpark, Bike & golf car rentals, Horseshoes, Shuffle Board, Nature Center, Basketball, Volleyball, Church, Snack Bars, Store, Laundramat, Skate Board Park, Arcade, Recreation Building With Activities, Library, and much more. Outside resort there is just about anything you might want to do in Myrtle Beach and the surrounding areas. Charleston is just a short drive away as is Pawleys Island and a lot of the beaches in North Carolina are not that far away. There are far too many attractions and activities in Myrtle Beach to name them all. My suggestion would be simply to do some internet research to develope a plan before you arrive. Some suggestions--Marsh Walk, Wild Water & Wheels, Atlantis Miniture Golf, Jungle Lagoon Golf, Broadway at the Beach, Market Commons, Big D Theater (IMAX 3D), Nightlife, and the list goes on and on. There are a lot of musical shows and Pirates Voyage and Medival Times which are dinner and a show. Check with the Recreation Center in Ocean Lakes and they will make reservations for you.